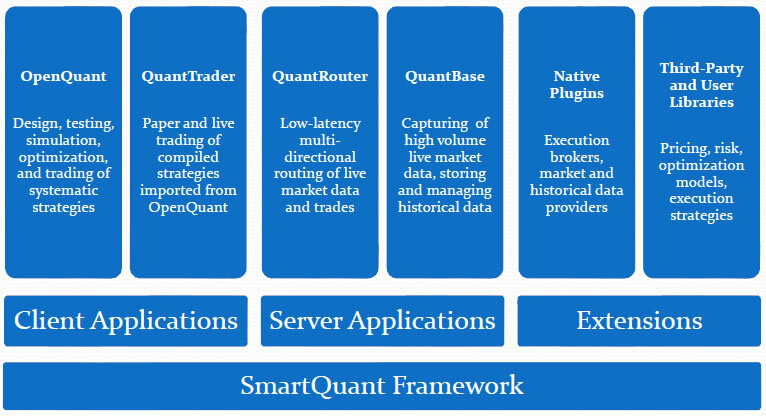 SmartQuant Algo Trading Infrastructure (QuantDesk) is designed for quantitative investors and traders, as well as institutional users such as hedge funds, proprietary trading groups, brokers, consultants and service providers. All products share the same underlying complex-event processing framework, which allows to seamlessly integrate them for tasks of any complexity. Developers can use a rich API to write their own strategies, while taking advantage of built-in capabilities such as consistent trading simulations, data management, and optimization. A server side application for market data feed replication, consolidation, aggregation, transformation and smart order routing.